The next Rusper Sports Club Committee Meeting will be the AGM to be held on Tuesday 19th April 2016 at 8pm in the Sports Pavilion on the High Street (next to the tennis court). As well as regular sessions at Horsham, Crawley, Haywards Heath and East Grinstead, OMF run a weekly PT fitness session at Rusper Sports Club. Pay as you go £5 per session (1 hour) – the sessions run whatever the weather every Friday from approx 9.30am. Sessions include a varied mix of circuit training, relays, partner exercises and running, to achieve an all over body fitness. 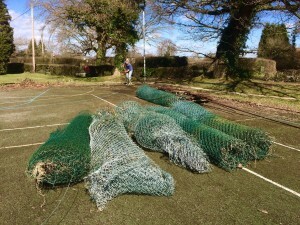 Court 2 Tidy-Up and plans for re-furbishment?? 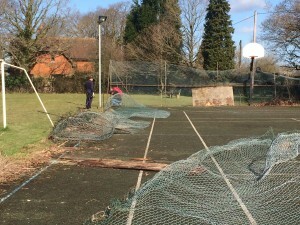 On Friday 25 March members of the RSC Committee set to to take down the fencing on court 2 which had become unsightly and dangerous. 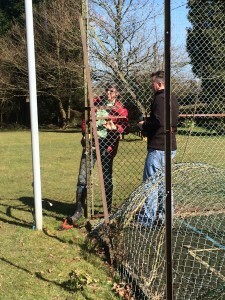 Currently the existing lease term is too short for the Club to be able to approach local bodies for grant funding to replace the fencing and refurbish the court. Should this position change then the Committee will look to apply for funds to undertake much needed repairs to the pavilion and possibly the refurbishment of Court 2. As on previous years, Rusper Sports Club will be providing use of the car park and pavilion to a number of charity sportives in the coming months – acting as a feed/water stop for the riders on their bike rides for charity. 22 May 2016. The sixth Pearson Sportive is a 150km cycle ride in aid of The Royal Marsden Cancer Charity through beautiful scenery. With two distances this is a challenge for all levels of rider, whether novice or experience. 26 June 2016. Join 1500 riders on the 21st Anniversary of this charity Bike ride from The London Eye down to Hove. Choose from 60, 80 or 100 mile routes.